Say Hello to Macheesmo Meals! I’m really excited about today. For the last few months I’ve been working on a new section of the site and today is the day that I’m sharing it with you all! The new section of the site is called “Macheesmo Meals” and I wanted to spend today talking about it, why I decided to create it, and how it can hopefully help you! I spend a lot of time chatting and emailing with people about cooking (as you might imagine) and over the years I’ve come to the conclusion that one of the hardest parts of cooking is not the actual cooking, but it’s planning what to cook. After all, there are gazillions of blogs online (like this one), thousands of cookbooks published every year, and any number of other sources for delicious recipes, but when it comes down to actually putting dinner on the table, it can be difficult to figure out how to make it work. The truth of it is that even though I love sharing sometimes elaborate recipes with you all, most people just want to be able to feed their families on a Tuesday after working 10 hours. That’s the problem that I wanted to help solve with Macheesmo Meals. Four meal plans each month. In each plan will be three dinners plus bonus recipes. Plans will be posted on Thursdays so you can shop on the weekends. Extras including shopping lists, preparation tips, ingredient substitutions, coupons, and a members-only forum! These plans are focused around recipes that use real food and are all designed to be made on a weeknight (the dinners take under an hour from start to finish). 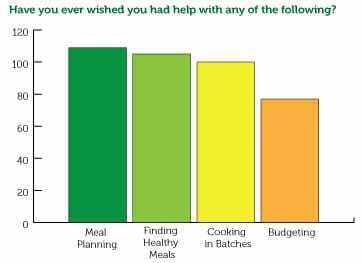 The meals in the plans are quick, healthy (with the occasional indulgence), and doable. Signing up will also give you access to a members-only forum so you can brainstorm and collaborate with me and the other Meals subscribers. You’ll also have access to a special form where you can ask me a question that goes straight to the top of my inbox! Are you Charging for this Sucker? The short answer is yes. It takes a lot of time for me to make these and there are some extra costs involved in running a community like this (time/software/etc.) That said, I did my absolute best to keep the program super-affordable. Ultimately, the plan will cost $12/month or $98/year, but right now I’m offering the program at a dumb-cheap price of $9/month. I originally was going to only give this lower price to the first 50 people who signed up, but I opened up the program to my email list on Monday afternoon and they snatched up most of those spots. So I’ve expanded it. If you are one of the first 100 people who signs up, you’ll lock in this rate and it’ll never go up. Pinky promise. You can read about the “I’m a Human Being Guarantee” on the Meals Sign Up page, but the short of it is that if you decide you don’t like the plans for any reason, you can easily cancel and I’ll refund your last payment (or a prorated amount if you’re an annual subscriber). What Does a Plan Look Like? I’ve already posted the first meal plan which you can have access to right away if you sign up. Because it’s August, the meal plan is all about tomatoes! 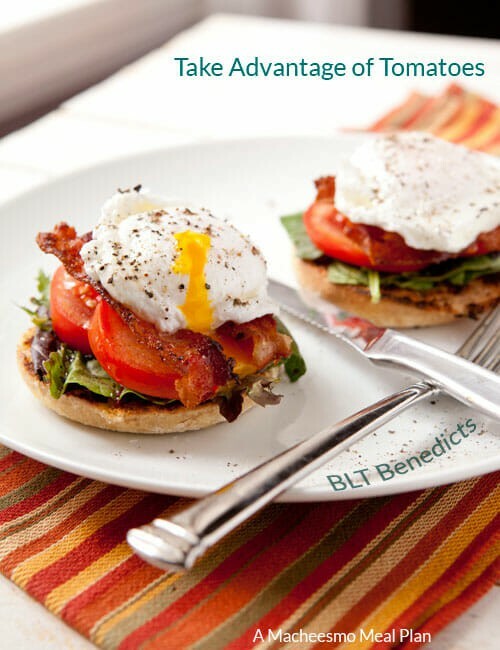 Besides this lovely benedict recipe, there are three other complete dinners that take under an hour to make and feature beautiful, ripe tomatoes. Each meal also includes a preparation timeline so you can see how I actually make the meals along with common substitutions (vegetarian, etc.) Also, I encourage people to ask questions on the member-only forum where other members (and me obviously) can help with questions. Also, there is a shopping list with each plan! These lists are easy to print out, check against your pantry, and head to the store! I try to leave plenty of room so you can add to the lists and have one simple page that’s split up by grocery section. I got this question a few times from people. This is very important. Nothing will change here on Macheesmo. I’ve been posting recipes and stuff on the blog for almost five years and I will absolutely continue doing so. Obviously, I will still answer questions and comments just like normal! If you have any questions at all, leave a comment below! I’m really excited about Macheesmo meals and I hope you take a minute to check out the features and hopefully sign up! I have to admit, I almost wanted to join this just so I could be part of the private community. But the truth is that our meal planning revolves around whatever we’re getting in the CSA at the moment, so it probably won’t work for us. Unless you have nothing but turnip-green recipes in there. Looks fun though, maybe we’ll think about it in the winter. Hey Heather, that’s totally fair. I do try to develop the meal plans around what is seasonal, but I use more generally available stuff and can’t get as specific as that really due to availability in areas. So for example, there are upcoming meal plans featured around apples and fall squash in the next few months. My goal is that the forums will be a great place where people can ask and recommend substitutions for specific ingredients like that. I think the turnip greens would be really nice in the farmer’s market stir fry in next week’s meal plan, for example. what a great idea Nick! Vegetarian here, so probably the meal plans wont work for me! Good Luck with the new offering! Also, we just moved to Denver this weekend! Trying to use this move as a way to develop some new, healthy kitchen/cooking routines.